Warm people, animated nightlife, and excellent attractions beckon visitors. From coast to coast, Mexico’s playgrounds provide vacationers with unparalleled beaches, countless cultural sights, top luxury resorts, and adventure possibilities. Never mind the hoopla that keeps being flashing on the news, tourism is thriving with very high visitor satisfaction from Americans who are not deterred by scary headlines. Like its’ northern neighbors, Mexico is a huge country and the problems that dominate the news are often isolated to border towns or specific cities. It’s no surprise that Mexico remains the number one destination, representing 15% of travelers, for Americans internationally. Visitors to the country numbered almost 23 million in 2011, breaking record highs despite the bad press in recent years. For gay and lesbian travelers, two towns that are representative of the Mexico beach vacation are Puerto Vallarta and Cancun. Puerto Vallarta, or simply Vallarta to those of us who lover her, is a bright jewel in the crown of Mexico’s resort towns. Nestled snugly between the Bay of Banderas and the Sierra Madre mountains, beach, sun and sand, join jungle seamlessly. Beyond offering the iconic beach experience, Vallarta has preserved and protected its charming colonial feel in spite of decades of tourism commercialization. Thanks in part to Elizabeth Taylor and the fame of Night of the Iguanas, the cobblestone streets that pave Vallarta’s Centro and Zona Romantica provide visitors a slice of nostalgic old Mexico. 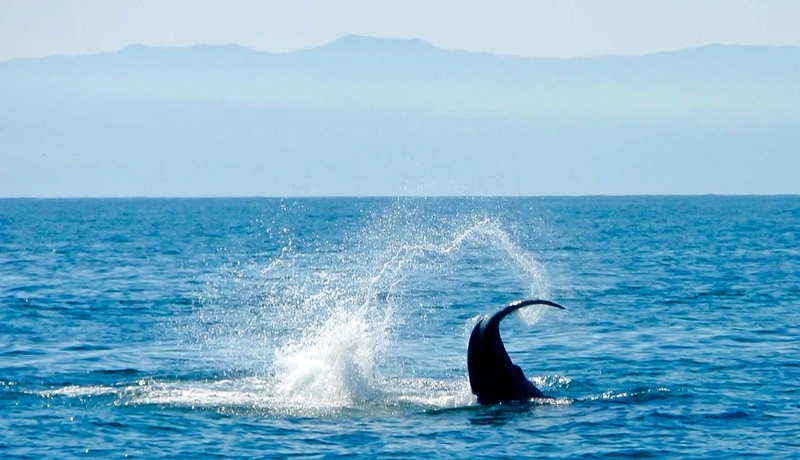 Vallarta is also a vibrant city, with a hopping nightlife, and bursting at the seams with adventure options. An artist working in sand welcomes visitors along Vallarta’s beach downtown. 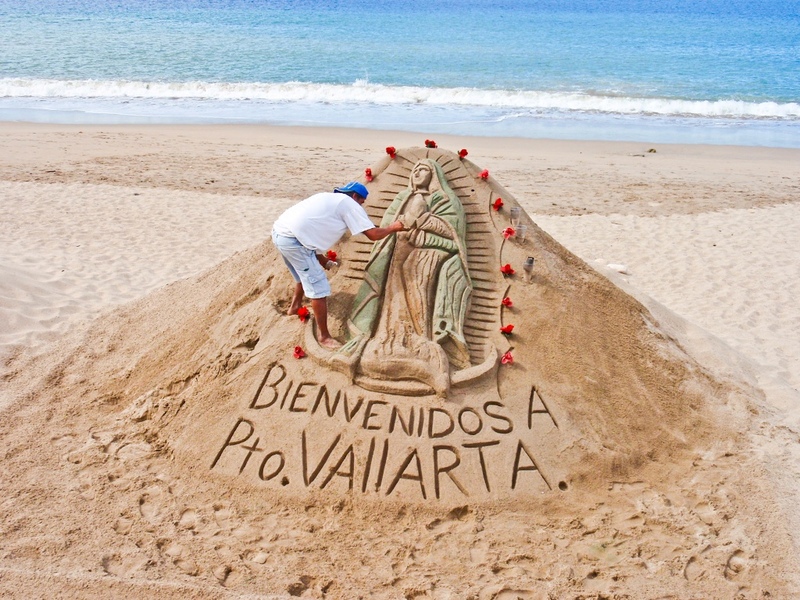 Like many Latin destinations, Vallarta prepares for Lent with Carnaval. Three years ago, it began to take on new meaning as the local gay community’s de facto pride. Whether the annual celebration sticks or falls by the wayside remains to be seen, but for now, it’s a bacchanal of celebrations with floats, a parade, and thousands of spectators lighting up the streets for one fabulous evening. Even when gay and lesbian travel to Mexico was still in its infancy decades ago, pioneers RSVP Vacations and Atlantis Events had bought out entire resorts for relaxing “gay getaways”. Atlantis is chartering the Vallarta Palace for a week, November 3-10, 2012, for one of the most awaited events of the year –Club Atlantis. Unlike the gay cruises they offer, land charters have a relatively more relaxed feel and pace. Start your visit with a walk up and down the Malecon beachfront. Views of the pacific are accented by fantastical bronze sculptures dotting the boardwalk, with painters and artists selling their craft by the three arches square at the end. Along the way, Vallarta’s Cathedral bearing the imperial crown of Kaiser Maximilian evokes the days of when Mexico was ever so briefly under Austrian rule. 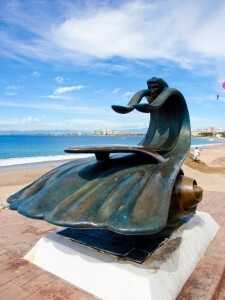 One of a dozen bronze sculptures dotting the Malecon boardwalk in Puerto Vallarta. For adventure seekers, a day trip to Las Caletas provides a secluded park with activities that have you climbing, falling, zipping or diving. At dusk, the cove is transformed for the Rhythms of the Night dinner show, with good food and an unmatched romantic ambiance of dinner by the sea. You can try your hand at Zip lining, and no other destination compares to Vallarta for options from beginner to advanced. Men can also mingle with other gay men on special tours. The Boana Hot Springs evening tour whisks you away late afternoon for over seven hours of relaxation; a quick hour bus ride followed by dinner, then free time to relax and unwind in the springs with an optional massage or facial. For a faster beat, board the floating club Sunset Party Cruise that departs from Los Muertos pier every Wednesday at noon stocked with a full bar and go-go boys. Paco’s Ranch is an institution of gay nightlife. This multi-level club is busy every night, but doesn’t get going until later in the evening. Apache’s Bar, while small, has a quaint setting. Garbo exudes a charm all its own, with a lively piano bar. Delectable martinis and original cocktails draw in a somewhat sophisticated yet fun loving crowd. Around the corner, the Palm rocketed to success when it opened by importing famous Canadian drag queens. Just on the other side of the Rio Cuale, Anthropology is a typical big-city gay bar with go-go boys. Wet Dreams bar has exotic male dancers on stage, sometimes behind glass and under a shower. During the day, the place for gays and lesbians to see and be seen at the beach is the infamous Blue Chairs, now also a hotel near the end of Amapas street. The rooftop bar of the hotel, Blue Sunset, is a great place to see the sunset, the ocean, or just start your happy hour. In winter, whales fill up the bay in Vallarta with boats vying for the elusive whale breach. Hotel Mercurio welcomes all to its central location in the Zona Romantica, and is very popular with gays and lesbians. Casa Cupula follows the opposite approach as a Gay and Lesbian hotel that also welcomes our friends and family, offering an upscale and intimate setting on the hillside. With unrivaled beach access and a good location, the Blue Chairs hotel’s uncomplicated rooms and suites put you in the middle of the action. Mainstream hotels Los Arcos and its sister property, Casa Doña Susana, provide the best amenity available: location. Los Arcos offers tasteful three to four star rooms right on the beach in the heart of the gay Zona Romanitica. A local secret is the onsite Kaiser Maximilian restaurant, one of the best in the world boasting multiple dining awards without pretention. 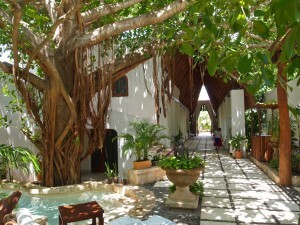 Casa Doña Susana is one block back from the ocean, behind Los Arcos, with boutique suites and rooms in hacienda style. 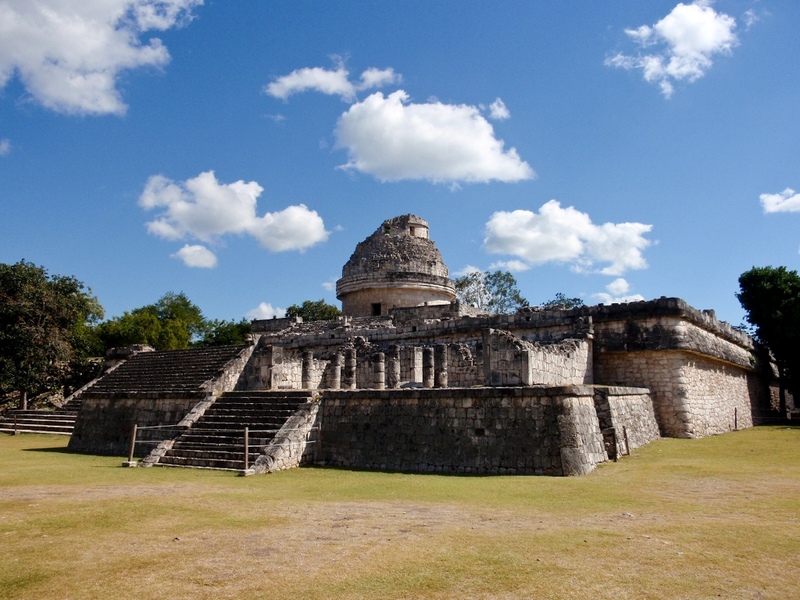 Ancient astronomical observatory of El Caracol at Chichen Itza, a UNEXCO world heritage site. In contrast to the Pacific resort towns and Puerto Vallarta which have been the focal point of gay nightlife and entertainment, Cancun and its resorts and towns on the Riviera Maya are only now emerging as gay destinations. Long overshadowed by its spring break image, Cancun actually has a growing gay community and something other Mexican resort destinations don’t: In recent years, hotels have popped up that are exclusively for gay men. Even ‘Adults Only’ resorts catering to mainstream couples have opened their arms wide, such as the hot and sultry Temptations All Inclusive resort which is a member of IGLTA. Gay events and nightlife here may seem sparse, but are expected to grow rapidly in coming years. And, for culture queens and heritage aficionados alike, there’s also no shortage of archeological sites. A visit to the Riviera Maya is incomplete without a tour of its cultural heritage attractions. The most visited and best excavated are Tulum and Chichen Itza. 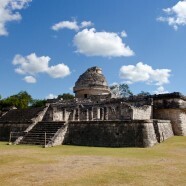 Unique due to its location overlooking the blue Caribbean waters, Tulum is an easy trip from most resorts. For those wanting to dare the infamous and often-unmarked steel speed bumps on the highway, the drive is also manageable by rental car. 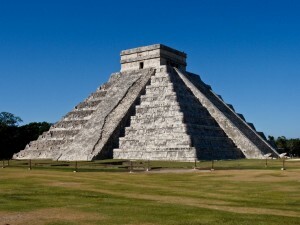 Chichen Itza is nestled in the jungle deeper inland and requires more planning. An insider’s tip is to leave as early as possible on a private tour, no later than 6am, or book a flight with MayaAir to reduce travel time dramatically. These options are more expensive, and the wakeup call may seem brutal, but if you arrive before the crowds you’ll be rewarded with an experience devoid of tourists crawling all over the site. Make sure to consider a stop at one of the many large sinkholes, or Cenote, for a swim or just a peek on the drive back to your hotel. Other archeological gems include Dzibanche, Kohunlich, and Chacchoben, all just now being discovered by tourists; they are one of the few places in the world where you can still climb an ancient temple. For ecologically responsible water activities, consider Xel Ha adventure park. Unspoiled natural excursions range from nature preserves, biking and hiking paths, to onsite spa, restaurants and relaxation areas. The most popular attractions, though, involve the water found in its many lakes, lagoons and bays. Playa del Carmen has always been a relaxed beach town with many evening options. Playa69 bar and dance club gives off a casual gay atmosphere, outside the hustle and bustle of Cancun’s main drag downtown, that still delivers Latin heat. Popular all day and into the evenings, Playa Delfines offers a gay beach hangout. Surfers and sunbathers may have contributed to its popularity. Maroma Resort’s Kinan spa embraces the surrounding jungle in its architecture and meandering paths. Resorts in the Cancun area run the gamut from ultra budget to ultra luxurious. A great example is the collection of resorts at the Barcelo Maya complex. Five resorts ranging from three to five stars are located adjacent to each other. Another exceptional property is Maroma by Orient Express. This award-winning resort delivers unparalleled service, exquisite cuisine, and welcomes gay couples and groups for events or just to unwind like royalty. Special his&his or hers&hers couples packages are available (code: SUITEGL). Unique to Cancun is the relatively new idea of the gay ‘men only’ hotel. This new product is similar to resort charters in Vallarta or gay cruises and tours, but year-round. The small MayaFair Gay Design Hotel has no-frills suites in the heart of central Cancun’s hotel zone, facing the lagoon. For upscale accommodations at an all-inclusive that’s exclusively gay, head to the Adonis Tulum resort. Almost a hundred spacious suites are decorated in a clean modern décor, many with jetted tubs on a private balcony overlooking the ocean. Marc Kassouf has traveled to more than three dozen countries, lived on four continents, and sailed on over sixty cruises. He owns an award winning travel agency and has published instructive articles for travel agents. Editor Marc Kassouf owns Pride Travel agency. He holds numerous travel industry certifications and has received one of the travel industry’s most prestigious awards, the WAVE TrendSetter, four times; the TrendSetter recognizes excellence and exceptional achievements of travel agencies and their executives. Kassouf sat on two board committees of the International Gay and Lesbian Travel Association, has traveled to nearly four dozen countries and has sailed on more than 60 cruises. Primarily, Kassouf's work is published in magazines, online and in print, reaching millions of readers around the world. Kassouf’s articles and features focus on destinations and products offering cultural, culinary, spa, luxury, river cruise, and experiential travel, sometimes with emphasis on points of interest to the Gay and Lesbian traveler. This online writer's portfolio, laid out as a magazine, is intended to showcase previously published material and clippings.